Right smack in the middle of the bustling CBD is a relatively new gem to chill out over beers and good food (served by hot waitresses no less) and the peps at our Singapore Food Blog & Travel Blog just has to check it out. 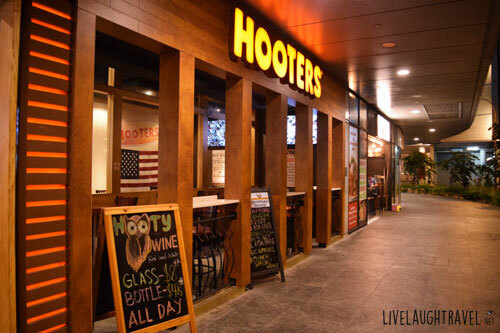 Welcome to Hooters – a name that is definitely not unfamiliar to most! Be prepared to be completely spoilt for the many choices of Mexican-styled food when you visit Hooter’s new outlet at The Sail. While you are browsing through the pretty extensive menu that offers huge portions of mains as well as platters to share, order the Hooters Margarita to start the night. This tequila-based cocktail is tinged with orange and lime juice, giving it a sweet and sour after taste which is a great way to warm up your palette for dinner. 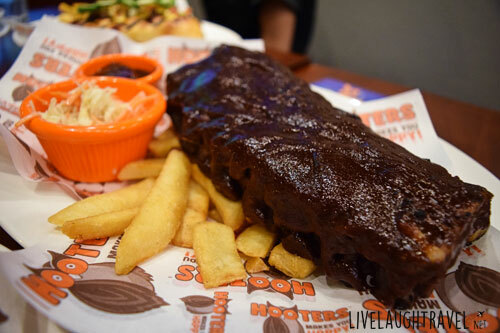 If you are feeling adventurous on this day, go for the full rack of Slow-Cooked BBQ Ribs. Soft, tender pork ribs that are covered with a generous dressing of BBQ sauce comes on a huge platter served with coleslaw and curly fries. 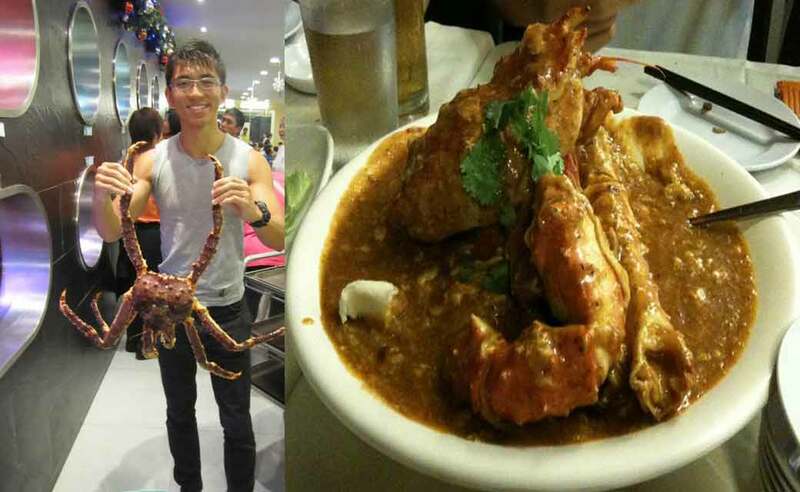 Forget about using cutlery, we went straight to the deed using our bare hands and licking the sauce off our fingers! Still feeling like more meat? Welcome to the Wings galore! 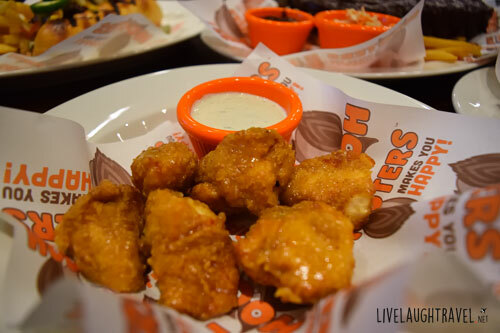 Choose from the Original Hooters Breaded Wings, Hooters Naked Wings, Boneless Wings and Bacon Wrapped Wings. The fun part is being able to choose the type of sauce you will like your wings to be accompanied with, and they do have quite a few to choose from! Well, 9 to be exact. From the super spicy 911 and 3 Mile sauce to the original BBQ sauce which offers just a hint of spice right down to the interesting non-spicy option of Parmesan Garlic sauce… We were indeed pretty torn and took quite a long time. On top of that, you still get to pick either the Ranch, Blue Cheese or Honey Mustard Dressing to go with your choice of 6 or 12 wings. Our recommendation: If you are feeling a tad lazy with using your hands, go for the Boneless Wings with Thai Sweet Chilli! A great combination that is easy to eat and will not dirty your beer glass. 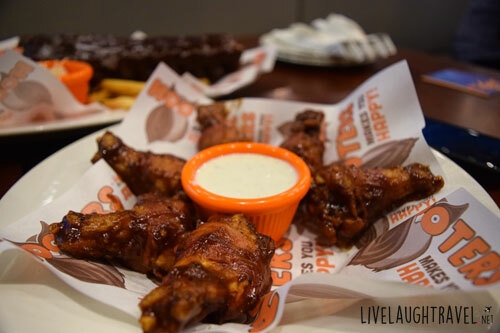 If you are up to some finger lickin’ action, opt for the Original Hooters Breaded Wings coupled with the mild sauce. We loved how juicy and buttery the wings were despite its breaded exterior, and pretty much devoured the whole plate within minutes. Next up, some ideas that will be great for munching and sharing over drinks! 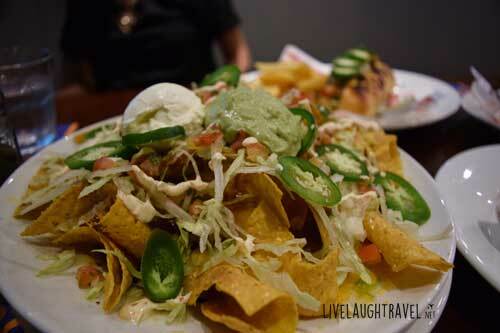 Tex Mex Nachos – A family favorite of crispy tortilla chips smothered with mixed cheese, fresh guacamole, lettuce, salsa, sour cream and jalapenos, topped with your choice of Beef Chili, Chicken or Cheese. Over a beer or two, you will slowly start to realise the huge platter depleting unknowingly because they are just so addictive and go very well with chit chats over drinks. Feel like a burger but doubt you can finish the whole portion by yourself? Not a problem. Go for the Sliders to share with your party – the platter comes with four mini burgers on toasted broche buns that are warm and soft, with either the chicken or beef option. 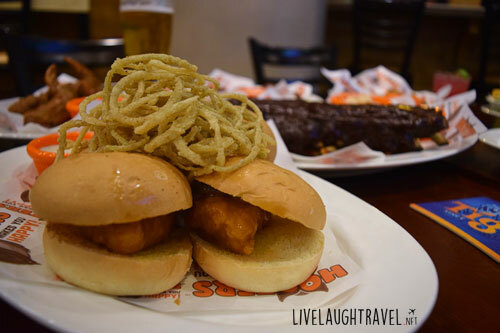 We personally loved the onion tanglers that came as sides with the sliders – crunchy on the outside with seasoned batter and crunchy on the inside with juicy onions! Last but not least, we will recommend to you our selected favorite of the night. 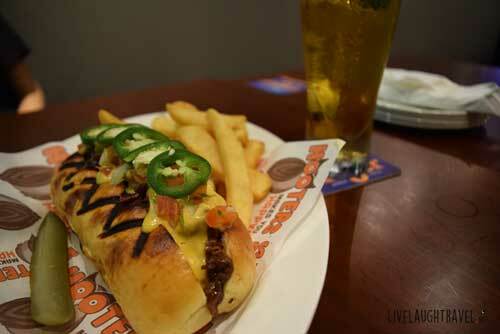 Presenting to you the Original Texas Cheese Steak Sandwich! The name might sound boring and expectable, just a slab of steak sandwiched between a bun and perhaps with a slice of cheese or two. Generous portions of sliced steaks drizzled with Hooters Daytona sauce, cheese sauce, salsa and jalapenos… Take one bite into this juicy, cheesy goodness-filled bun and be surprised by the fantastic combination of sauces and tender meat slices. This is also paired with a hot favorite side of Curly Fries! At the end of our meal, our stomachs were bursting, especially from the crazy loot of meat consumed. What really took us by surprise was that Hooters had such an extensive menu to offer. I’d think of Hooters as a place to chill and have a pint of two after work and probably would have taken my dinner elsewhere before heading down. Well, at least now we know we can kill two birds with one stone – enjoy a good dinner in a great atmosphere (especially if you are an avid sports fan since they screen many different sport matches in the cosy area) and not having need to travel far after work for that ice-cold pint that you have been dreaming about since noon time. Keep a look-out for their upcoming lunch menus that will bring about a fusion style so people who prefer Asian food will have their pick as well. It will be utmost suitable for the office crowd who are looking for a quick bite that is also healthy and affordable. We don’t know about you, but after our scrumptious dinner tonight, we will definitely be back to try their new lunch menus once they are out! Singapore Travel Blog Copyright © 2019. Subscribe to our mailing list and get to know firsthand about other interesting travel articles and tips in your email inbox. No Spam! No Disclosing of your Data!